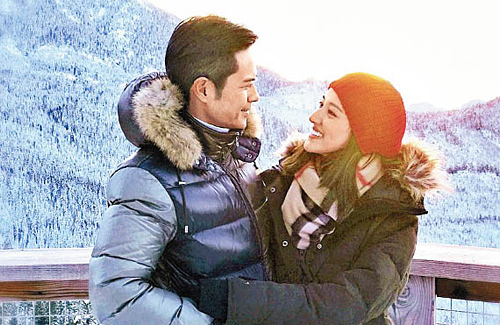 With news breaking that Grace Chan (陳凱琳) and Kevin Cheng (鄭嘉穎) are getting married in August, the couple was reluctant in confirming the news at first. As talk soon turned to whether Grace is pregnant, the 27-year-old actress finally felt it was time to put the rumors to rest. On her Instagram account today, Grace revealed that she and Kevin had gotten engaged since Christmas. Although Grace did not reveal the details of her wedding, it was reported that she and Kevin will get married in Bali, Indonesia on August 12. Natalie Tong (唐詩詠), Kenneth Ma (馬國明), and their good friends have allegedly taken days off to attend the wedding. I wonder why so many celebrities goes to Bali to have a wedding over there? Is it because of the beach? Or is it cheaper to have a wedding over there? Reporters need to stop asking Grace about rather she’s pregnant or not since she’s already told them that she’s not expecting just a wedding. @cutie777 The celebrity trend is to have a small, intimate overseas wedding first for family and close friends. Since it’s outside of Hong Kong, it’s more privacy. Bali, Indonesia has a lot of nice resorts and reasonable prices. Afterwards, Kevin and Grace will probably hold a bigger Hong Kong banquet to include more colleagues in the HK entertainment industry. Judging by how many days it took Grace to respond to the wedding news, I do think she’s expecting. The couple’s reaction initially was to dodge all wedding questions…where if Kevin had proposed in December, they already had a long time to plan. But their close friends, Natalie and Kenneth, seem to say they are on “standby” and not clear about the details, which imply that the wedding was only arranged recently. @jayne She’s hoping to end the rumors. Time will tell. @jayne well I won’t be surprised if the bride-to-be was the one who tipped off the media (anonymously), you know like throw out some blood to lure the sharks into a feeding frenzy. Then she will take her own sweet time to respond to the media after they have helped her whip up days of news and speculation . Free publicity for her. I have a good feeling she is pregnant too. This wedding seems sudden, she goes to the hospital several times, and all that just seems too coincidental. Time will tell all but I must say I do not believe in not revealing for the first trimester. My sister in laws all told me right away when they were pregnant with my nephews and they are all fine. Also, things can happen after the 3 months mark too. I remember Kelly Chan losing her twin daughters at 5 months. Basically that 3 months thing is just a myth in my book. @jayne well I don’t know Jayne I guess time will tell but again like I mentioned on one of the articles about Eliza Shum her wedding was kinda rushing too so how come nobody thought maybe because she’s expecting that’s why her wedding was rushed like Grace is? as usual motor mouth will make her wedding and pregnancy a free flow of info for the waiting media. can she disappear for good? the buddies like Natalie applied for leave to attend their wedding. I can’t forget Nicky Wu’s romantic wedding in Bali…beautiful flowers imported, the whole atmosphere was just perfect.